Christof van der Ven originates from a small town in Noord-Brabant, a province in the South of The Netherlands, but now resides in London, after spending multiple years living in Ireland. From there, he’s already build quite the oeuvre, containing six EP’s. He toured as the support of the likes of The Staves and Bear’s Den and last year joined the latter band as a touring member and has been playing one sold out venue after another throughout Europe and recently the United States. Usually I’ve known the musicians I approach for a session for ages, or I at least know their last names. Not this time. So, last year, after I heard Christof’s latest EP Montreal and was blown away to be quite honest, I quickly sent him an email. I wrote it in English. Didn’t even do two minutes of research, just because I was so enthusiastic about his music and wanted to let him know straight away. Had I looked for even a minute, I would have known he is a fellow Dutchman. Upon reading his reply, I found out we even share the same last name. What are the odds? Anyway, we quickly agreed to arrange a session the next time he’d be in The Netherlands and he came and played at Onder Invloed’s event at Café de Stad in Utrecht last December. Van der Ven’s latest EP Montreal has nothing but great songs on it, like You Left It Too Long, Never Never (see below), and Oh, When The Night, which features heavenly backing vocals by The Staves. But his earlier work is just as good, just listen to Carousel, Love’s Glory or Empty Handed if you need convincing. I love Christof’s songs and you will too. He craftsmanship reminds me of some other favourite songwriters, like The Staves and Bear’s Den of course, but also Kim Janssen, Bertolf and Three Blind Wolves’ Ross Clark. But any comparison is just that, Van der Ven has created his very own signature. 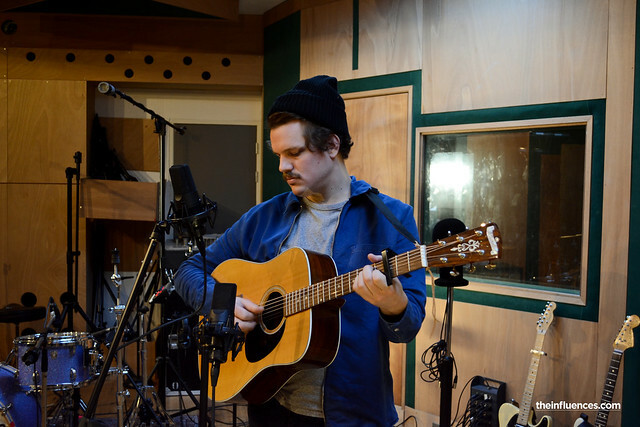 Just before flying to the States, Van der Ven came to Utrecht and recorded this session for Onder Invloed (The Influences) at the Mailmen studio. Just like at Café de Stad, he produced some breath-taking covers of Leonard Cohen and Fionn Regan.